Just two faded leaves or is one a leaf insect? How many leaf insects can you see in this picture? This week we leave Florida’s sunshine where we visited spectacular orchid bees and oil bees, leaf beetles, giant grasshoppers, and walking sticks and travel some 10,000 miles to the tropical forests of Malaysia to meet one of the true mistresses of disguise in the insect world – the Giant Malaysian Leaf Insect. Here in the Cameron Highlands just north of Kuala Lumpur, these titans occupy the forest canopy where they dine on the leaves of luscious tropical fruits such as mango and guava. In the wild, adults attain the enormous length of 4 inches. One wonders how an oversized tasty meal of this proportion escapes the searching eyes and hungry beaks of forest dwelling birds. Evolution has guided the morphology and behavior of these giants into an astounding masquerade, as they appear to be nothing more than tattered leaves at rest or foliage swaying in a gentle forest breeze. Their bizarre body outline conveys an image of “leaf” rather than “insect” by presenting a greatly flattened and expanded abdomen and wide foliate plates on the legs. Their bodies are hued not only with colors of healthy green plant tissues but also with muted shades of senescing foliage. Here and there on this colorful canvas small patches and spots of what appear to be microbial lesions complete the ruse of this leaf-like doppelganger. At rest their appearance is nothing more than a tattered leaf and with a puff of wind their bodies rock and sway as would a leaf in the wind. As they move from place to place on a plant, their gait is not the typical six-legged, full speed ahead motion found in the majority of the insect world. No, their slow saunter is punctuated with short stops accompanied by swaying of body and legs. 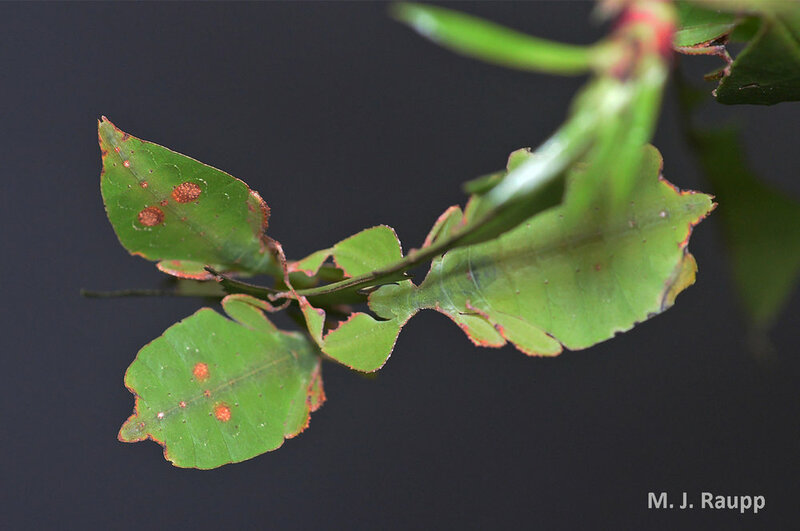 While strolling along a branch, this leaf insect nymph makes occasional stops to rock and sway. Puffing on a cluster of leaf insects sent them into a tizzy of movement. Was this a response to air movement or panic due the odors of a vertebrate’s breath? At the insect zoo at the University of Maryland, our colony of Giant Leaf Insects is populated only by females. Like other members of the phasmid clan, Giant Leaf Insects are often parthenogenetic, that is, they have the ability to reproduce without fertilization. In the wild, populations of Giant Leaf Insects were once thought to be comprised only of females, but the discovery of a rare male in Malaysia in 1994 and in some captive colonies provides evidence that males still have a place in the world of Giant Malaysian Leaf Insects.